On October 15, 2018, the Howard County Economic Development Authority (HCEDA) celebrated our 25th anniversary as an organization during our annual meeting at Two Merriweather in Columbia. The event included a networking happy hour with beer tastings from local breweries, Jailbreak and Hysteria, in addition to a historic overview of Howard County and its economy, a preview of what’s to come, and recognizing the next generation of talent through the Patty Keeton Scholarship Award. CEO of the HCEDA, Lawrence Twele, was joined by County Executive, Allan Kittleman, Maryland Assistant Secretary of Commerce, Steve Pennington; and Regional President of Howard Hughes, Greg Fitchitt; to welcome the 200+ event attendees. Each speaker acknowledged the pivotal achievements made by the HCEDA and its impact on Howard County’s businesses. 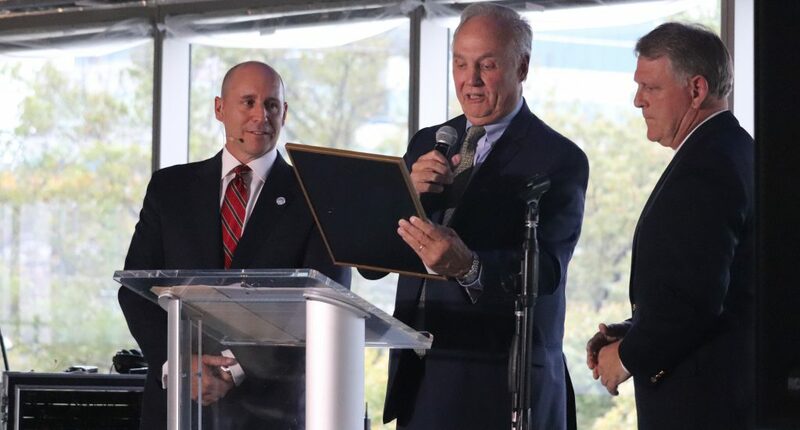 In recognition of promoting economic growth and stability throughout the region, supporting local businesses, and attracting new companies to Maryland, Pennington issued a citation to the HCEDA by the Secretary of Commerce. Pictured: Lawrence Twele, Steve Pennington, and County Executive Allan Kittleman. The program continued with presentations by Anirban Basu, Chairman & CEO of Sage Policy Group, who discussed the statistical milestones of Howard County’s economy in addition to predictions for the future state of the county. Twele continued the conversation by providing a historic overview of the HCEDA, since its launch in 1992. Video produced by Outer Loop Media. Twele concluded his presentation with a meaningful message of supporting all levels of professional development by continuing to identify more opportunities for businesses to coach our next generation of business leaders. In memory of former Howard Tech Council (HTC) Board Member, Patty Keeton, Executive Director of the HTC, Tracy Turner, presented The Patty Keeton Scholarship to honor excelling Howard Community College students whom are active in serving their communities. Dominique Edwards was the recipient of this year’s award. She plans to use the funds to finance her nursing degree and looks forward to continuing her academic goals with the aid of the scholarship. 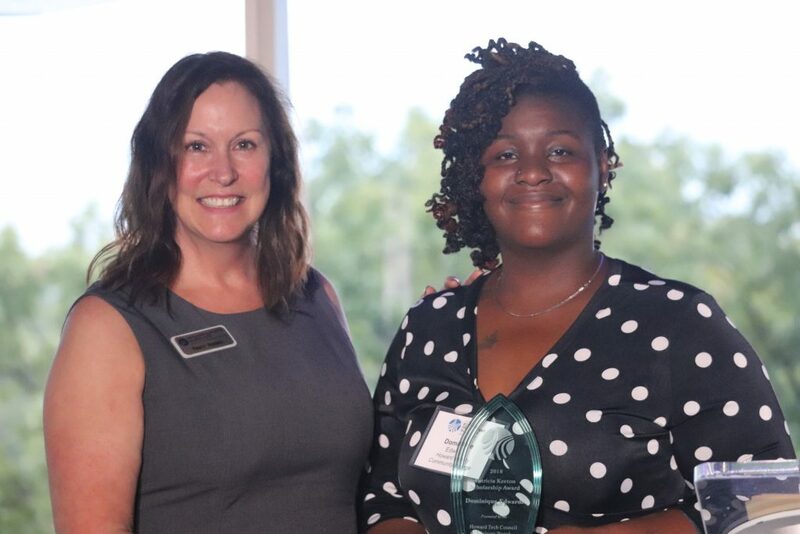 Pictured: Executive Director of the Howard Tech Council, Tracy Turner, with Patty Keeton Scholarship Award recipient, Dominique Edwards. As the program continued, HCEDA Board Chair, Dr. Tim Collins, introduced Ashley Llorens to the stage. Llorens who is the Chief of the Intelligent Systems Center at the Johns Hopkins University Applied Physics Laboratory (JHU APL) enlightened the audience by showing us what the future of Howard County’s innovation will look like. Demos of robotic tools and structures created through JHU APL’s robotics program were displayed, as Llorens thoroughly explained the mechanics and significance of each; some of the robots shown had the capacity to aid those who are paraplegic with transmitted mobile functioning requests, others were designed to perform as a team. For example, a collective unit of robots, varying in size, worked cohesively to perform an analysis and chemical testing to ensure safety for emergency first responders (seen below). The annual meeting was more than a celebration of our history, but a celebration of the future of Howard County and its diversity. Thank you to our sponsors, staff, presenters, and participants for making this event special and one to remember. Howard County is home to a diverse and thriving business community of entrepreneurs, innovators, subject matter experts, teachers, mentors, and professionals, and we are honored to serve this community. We look forward to another 25 years of service. To see more photos from the event, please visit our Facebook.